Made from 100% prime alpaca in all natural colors. Skeins are 3.5 oz., approx. 250 yards, and 3-ply, giving it a round body and soft touch. 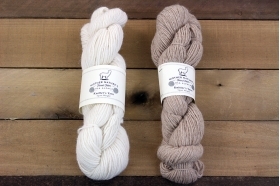 Sportweight comes in white, light fawn and heather brown.